Snack Girl receives desperate e-mails almost every day from people who are hungry and don't want to eat. Frankly, I never know what to say. Help! I am out of control! I want to eat everything in sight. What should I do? So, I say something like, "Eating less and eating healthy is a process! Calm down, and realize you are in this for the long haul." - which sounds kinda psychobabbly and lame. 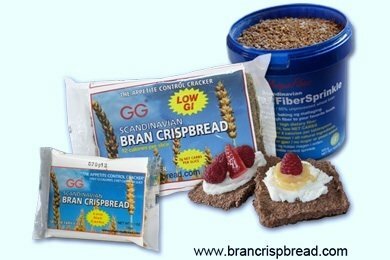 Then, a crazy Norwegian company sent me some almost inedible crackers - GG Scandinavian Bran Crispbread - they call them. It seems that the Gundersen family has been making these crackers since 1935! Well, I was going to give them away - and then my daughter actually liked them. Huh? And, I realized that this is a solution to the problem of being hungry between meals and not wanting to eat anything. This is seriously like eating NOTHING because it will take your body some energy to digest these crackers. The only thing is that they are kinda DRY plain. That was the mistake I made when I first tried them - I didn't add anything to them. You know something? I actually liked this snack! I did have to wait about 10 minutes to feel full - but overall as far as a low calorie, healthy, and fast way to stave off hunger - this works. If you don't like hummus, try some peanut or almond butter, cream cheese, or any other of your favorite cracker toppings. BE AWARE that a side effect of eating a lot of fiber is that you may have to make more trips to the bathroom (if you know what I mean). Most Americans are way behind on their fiber consumption so it may not be an issue for you. They are sort of like all-bran got stomped by an elephant and made into a wafer. I eat them to stop my pacing the kitchen late at night or to cure the same thing around 3:30 in the afternoon, which allows me to stay on my eating program. My suggestion is to TRY these and if you find that you like them - hurray! Low Calorie Comfort Food - It Exists! Why Don't Americans Serve Eggs Like This? Would you recommend giving this to young children? Diet and health gurus recommend 40 grams of fiber per day. Currently, the average American consumes about 15 grams per day. Because fiber provides the feeling of satiety, it is the most powerful "aid" for weight loss and for never having the feeling of being hungry. A very good high fiber bar is from Gnu Foods. Check 'em out online. I think they'd be pretty good with hummus or a tiny bit of cheese! I'll have to look for these. Kind of reminds me of Wasa flatbread. Wasa isn't that great by itself but with some hummus or peanut butter it is outstanding. And it fills you up too! Wasa flatbread are made in Sweden. Wasa is easy to find too (I live in a small town) since Walmart and Kroger carry them. I guess that part of the world knows how to eat!!! i make wheat bran protein "cookies" and they're pretty dry but the wheat bran keeps things ... moving and it keeps me full! plus, they're dry so they take longer to eat & increase my satiation. i like to spread dry crackers like this with nonfat plain greek yogurt. it's cool & creamy & so good! protein + fiber = great snack! I actually read about these a while back and tried them and with some hummus they are pretty good and quite satifying. I didn't care for them with cheese as they just need more to flavor them but they are great fillers. I'm so glad you posted this, I had forgotten them and could use a lighter snack. If you didn't mind some "good fat" and a few healthy calories, these crackers would be great with a thin layer of avocado. Crunchy and creamy! To the person who wants to eat everything in sight. That happens to me when I eat sugar so I stay away from it for the most part. I think it is because my blood sugar goes way up after having a sweet snack and then plummets when the pancreas starts pumping out insulin. It takes some planning to find non-sweet snacks and treats, but once I went through the sugar withdrawal I felt so much better. Now I only have sweets on occasion and my appetite is controlled. Another thing to try... Yogi brand "Healthy Fasting" tea. When I'd really like a glass of wine & a plate of cheese & crackers in the evening this tea is pretty satisfying (not as much as the wine & cheese & crackers would be, but much better for you.) For some reason this flavor seems to make me seem fuller than other teas. I would recommend giving these to kids after the age of 3, as fiber can block the absorption of some nutrients for growing little kids. Also, very important to drink sufficient water with them, or you might actually get clogged up, as the presence of fiber in your gut causes water to be absorbed into the gut, need enough water to do that. My daughter eats high fiber like all of my family now that she is 5 1/2, but she does get a "belly ache" (gas) sometimes after eating shredded wheat cereal, so I give her a smaller portion of that, but she eats the beans, wheat bread, fruits and vegetables like the rest of us just fine. These sound like a great snack for when you are in the mood for something crunchy or when you are starting to crash around3/4 pm like the person above said! I love the Finn Crisp ones that are rye but 3 of those have 3g of fiber and ONE of these has 5g! Thank you for sharing, I will definitely pick these up especially since they have prime shipping on amazon! Where do you get this? Usual grocery store? Trader Joe's or heath food store? I will add to the post - ooops! Thanks! im from the philippines and want to know if there any specific store where i can buy this brancrispbread? thank you very much and hope to hear from you soon. Topping these with some Laughing Cow cheese and a slice of tomato.....GLORIOUS!!!!! wonder if they have this in oat bran, sensitive to wheat. The nutrition facts don't look correct. Something that has 7 grams of carbohydrate and 1 gram of protien can not be only 12 calories.